It isn't customizable, it's cheap because it's ready to go. Then you will get an email with the download link. You can also come back to your Etsy purchase account and download. Once you have the file you can print them off and start the party! Print on 8.5x11 white cardstock then cut! We accept paypal and all major credit cards. Trade is available upon request. I give shop credit for any returns. No refunds. All of my cards are customizable, but have only been print-tested in the original colors. If you choose to change colors, you are responsible for print quality in those colors. I DO NOT PROVIDE THE BLANK OR EDITABLE FILES. NO EXCEPTIONS!!!!!! I will always respond to e-mails and conversations and I do my best to have a proof to you within 24 -36 hours (usually less, but check the front page of my shop for updates). If you haven't received anything in that time frame please contact me. Katiedid designs cannot be held responsible for the color differences from computer screen to prints. With so many printing options available and companies from ink jet printer to photo paper the quality and differences are slight. The only way I can guarantee color is when printed through katiedid designs. If you opt to print on your own this is at your own risk. Details/wording for invitations and announcements must be typed out and not handwritten or scanned documents. You can request as many changes as you need till it’s perfect but you get 3 free proofs. I hold onto proofs for 30 days, and any changes can be requested within 30 days of purchase. All printed invites will have my logo and website printed small on the back of all invites. Unless a patterned print is purchased to print on the back. White envelopes are included with every print order unless upgrade for the colored envelopes is purchased. 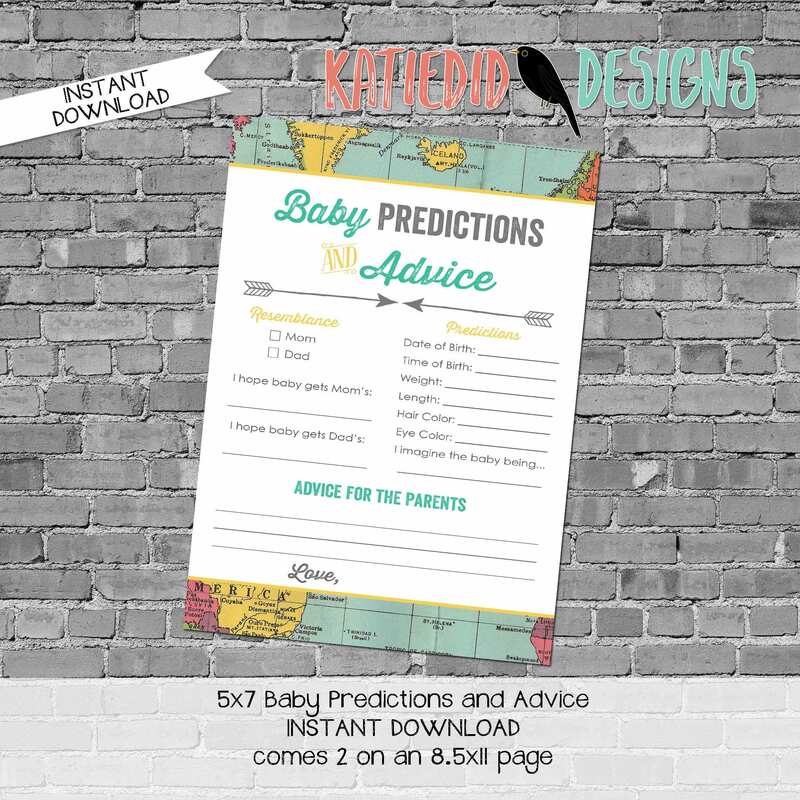 All designs in whole or an element belong to Katiedid Designs. Any use of the design in whole on in piece for any purpose than intended and agreed upon is a violation of copyright. It is therefore against copyright regulations to resell any design as a whole or an element. *The files sent to you are to be used for personal use only. * Should you have any questions on what you plan on doing with a digital design feel free to contact us via email. Because I work from my home with four small children, I cannot do business over the phone. I am available on chat through skype, ichat, and gmail. I also reserve the right to refuse business or refund charges to people who are pushy or rude. I hate say it but it happens and I am reserving that right. YES. All my cards are totally customizable. There are sometimes additional fees for the additional work. Just hit the Contact Seller button and ask away! When you purchase there is a Note To Seller section. Just pop all your event details there and Ill do all assemble your card and email you a proof. The 13.00 (or 15.00 for some designs) is for the design work (my time) creating your card. Its the way to go, thats what it is. It is a purchase option in which you can order the design work for the Invite and two matching items. Check out the photos for a list of all the matching items I can create for you. Don't see what you have in mind? Ask me about it! I would love to take printing off your party planning plate. You can order your printing by selecting the amount you need from the "finish" drop down menu. If you don't see the amount you need, just ask. Can I edit my card? I will handle all the editing for you! You and I will work together to customize your card. You will get an assembled card after you provide all the details. What matching items do you have? I have so freaking many! From bring a book cards to water bottle wrappers I pretty much have everything you need. If you don't see what you are looking for just ask and Ill take good care of you. How quickly can I get my card? If you needed your card last week, you are in luck, that's my specialty. Once you order your card Ill just need 24 weekday hours to get your proof over to you. If you need it sooner just select RUSH from the finish drop down menu and in most cases I can get your proof same day.